My first novel, and, I think, not bad for a first novel. Written in late 1980 and early 1981, as I recall. I’d just gotten laid off from a programming job, and my wife said, “Why don’t you take six months off and write a book?” so I did. I really like the cover. This is a test. This is only a test. Had this been an actual post, it would have been funnier. There will always be a soft spot in my heart for Jarhead. Though you have certainly become better as a writer since you’ve authored it. I would really love to have this as an ebook! I believe that’s coming; I’ll check when I get back to town. Hi there Steven! I had a question. In the Jhereg (and some other later books as I recall, I haven’t re-read them all yet), you mentioned the Jenonine. Are these a play on Anunaki/Niphileem? It reminds me of the things postulated by Zecharia Sitchin. Nope, Sorry, not at all familiar with Sitchin. Sitchen actually believes and explains (with fascinating evidence) that humans are a creation of genetic manipulation between apes and Anunaki. Whether one believes it is true or not, it certainly is fun to think about. It’s a fair question, lol. The Anunaki include En.Ki (also known as Lucipher) whose brother is En.Lil (also known as God). En.Ki (according to Sitchen) was the ‘god’ who told Noah to build the arc. Enki was the one on our side, whereas most of the Anunaki (gods, niphleem, etc) just viewed us as insignificant slaves. It’s been years since I was studying the topic. I lost interest and forgot most of the finer details when I realized I couldn’t do anything useful with the information except perhaps weave it into fantasy novels to give historians/philosophers something to think about. One interesting point is that the Anunaki were said to have set a time limit on our lives (telomere on our cell tails) on purpose, whereas Anunaki lived to be 6000 to 12,000 years old. That is another reason why I thought you might have read about it. Much in your books reminds me of Sitchen’s postulations. If you’re ever interested in some very wordy reading (which you may be, considering The Phoenix Guards), and some interesting ideas, Sitchen book The 12th Planet is pretty good. If nothing else, it’s a great history lesson on the Sumerians. That seems very reasonable, if you use the Flying Spaghetti Monster as the standard of comparison. Glad you’re enjoying the book. 🙂 Thanks. Steven i have been with you from the very start of your writing career, and like you i have loved the cover of Jhereg from the get go. The cover art work is what drew me to it initially i am sad to say but then i started reading the back and had to buy it immediately. your protagonist took on a life of his own in my imagination, the world you spun tales of kept me coming back for more. I would love to see you write another chapter in the Bordertown series while your at it. I loved gypsy very much an was wondering if there were any chance you an Emma Bull would be collaborating for more there? Thanks for the kind words. Nothing planned with Emma, but then, none of my collaborations have been planned before they happened. Is there any update on ebooks of Jhereg, etc? I want to start the series, but my arthritis makes print copies too difficult to manage. None. And I’m getting really pissed about it. Ace wants to do them, and I want to do them. The bottleneck is my ex-agent. You can find her picture in the dictionary under “procrastinate.” I am seriously considering doing a blog post in which I give out her email address and ask people to deluge her with requests. But that would be unprofessional, so I’m not going to do it. Well then, what if you do a blog post and just mention who your ex-agent is….I’m sure we could *find* her email address ourselves. Amazon claims that the Book of Dragon will be available as an ebook from July the 22nd 2014. But no word at all about the other omnibus editions. I know. Back when I played NeverWinter Nights I used that one as an avatar (of course, with the kind permission of the artist). There are some issues, but they appear not be related to anything Ace is or is not doing. These are old contracts and I think that SFWA is helping him work things out. I have the first 13 books in paperback and finally broke down and bought the last 7 that are available in a Kindle edition (I was trying to wait to buy the whole set) as my paperbacks are falling apart from multiple readings. Add me and my husband to the list of fans that would jump at the chance to get an ebook version of the first 7 books. 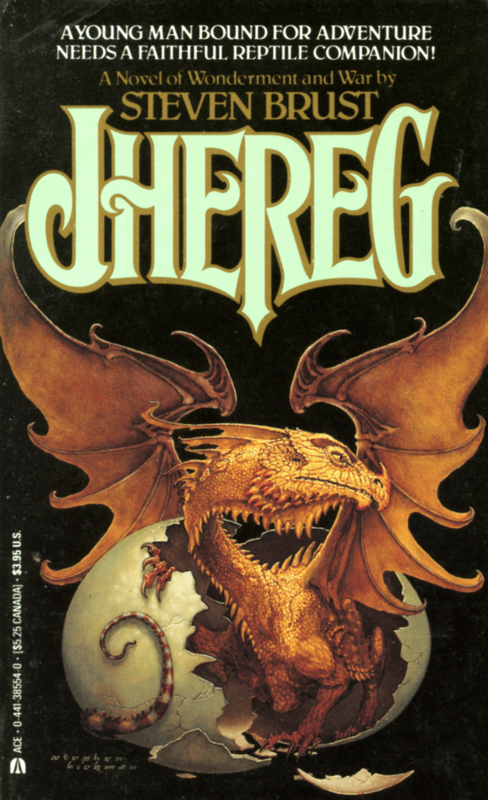 Fantastic books – started in 1983 with “Jhereg” right out of college, and have read them all many times. Sure would be great to get these earlier works on my Kindle. I just finished “Hawk” (which was superb) and have a hankering to go back and re-read the series again. Thanks from a grateful fan. I have Jhereg on paperback at home, but was hit with a sudden craving for Vlad (teehee) at the airport and was hoping to read it in-flight — I don’t think there’s a higher compliment I can pay an author, Steven, your books are brilliant! — but alas, Jhereg still appears unavailable electronically, at least on Kindle. PUHLEEEEEZE do whatever you can to get the earlier Taltos novels issued in ebook format. I need the series in kindle format and am ready and waiting to whip out my credit card. Seriously, you, your agent, your ex-agent, your publisher et al. are missing out on a lot of income. Been on a binge all week. Reading the ebooks!!!! So glad they are out now! Had most all of the series, until a house fire destroyed every book I had collected over years. Jhereg is wonderful, and have read it many times over, and will continue to do so. Like you, I love the cover art! Loiosh looks great. The cover art of him is always been how I picture Jhereg’s in my mind as I’m reading. Always wanted one as a Familiar myself. Looks much like a D&D Pseudo-dragon. I found one. Just picked-up a Windstone statue of a dragon that has an outstanding resemblance to the cover art of Jhereg. I’ll try to email pics to you.